Umbria is the only landlocked region on the peninsula of Italy. 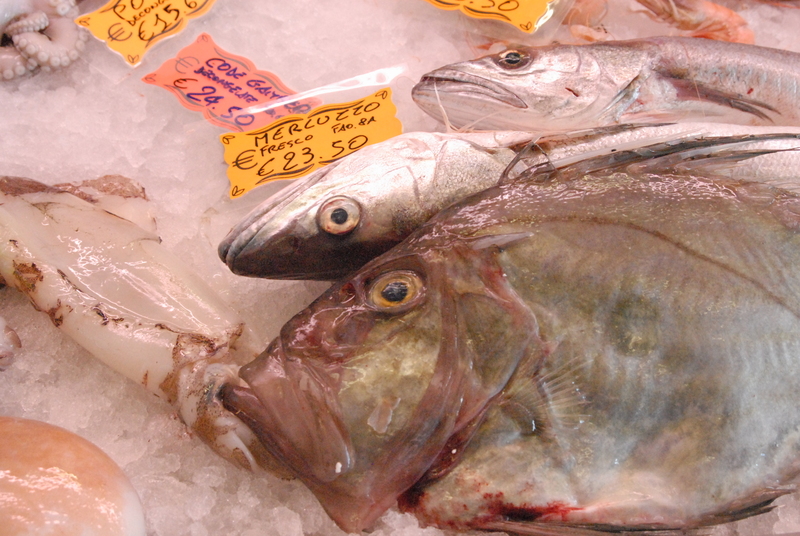 It’s safe to say that Umbrians are not famous for their fish. As an American, I’m used to eating fish or any other food that traveled many miles. I’ve had Dungeness crab in Chicago, sushi in Idaho, and Rhoda Island oysters (in Seattle). A few extra miles don’t bother me, so I was curious to try the fish offerings in Perugia. Every day, we passed a beautiful fish market on the way to the fruit stand. Clearly, they were Umbrian and didn’t seem to have a problem with the seafood. So this spring, after nine months, I finally stopped by. La Perla Nera is a family business. 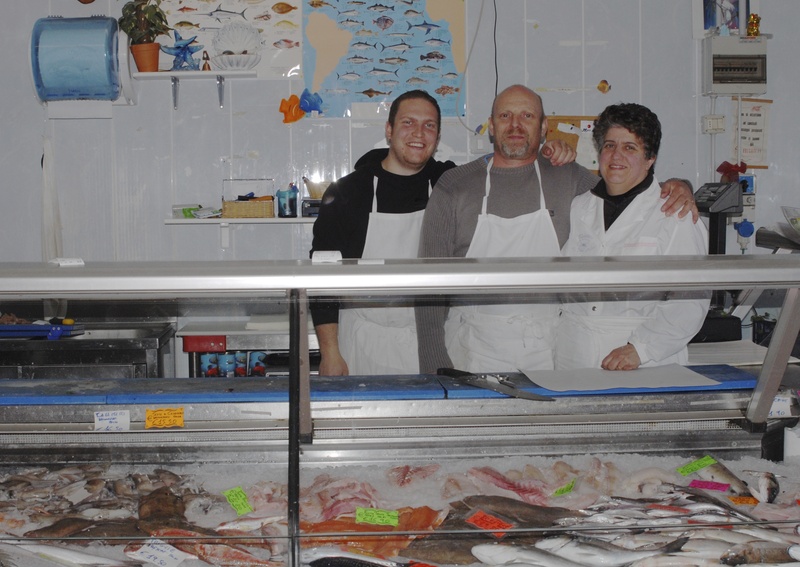 Signora Patrizia, Signor Franco and their son Michael are open four days a week. I loved them immediately. They were funny, confident and always generous. They prepared my order with great care, always gutting, skinning, filleting and slicing it to perfection before tossing in a handful of parsley. And they never let me leave without a detailed recipe. I decided right away that I would try every fish dish they could teach me. I started with spaghetti and clams. Then I made fried calamari, salmon rolls, fish coquettes, swordfish sandwiches, fried filets, marinated squid with olives, fish with cognac, and fish soup. I kept a list of the greats and politely forgot the not-so-greats. The more I tried, the more recipes Signora Patrizia gave me. To make fish balls, you need an assortment of fish. I can’t find the Italian fish that La Perla Nera sells, so I’m using ling cod, Alaskan rock fish, and Petrale sole. Combined, the fish should total a pound. To prepare, lightly sauté them in oil and garlic. Gently break apart with a fork as they cook. Then add about 4 or 5 gulf prawns that have been whirled in a food processor. Add salt to taste. Remove the cooked fish and prawns from heat and allow it to cool. Then add a tablespoon or two of chopped parsley, an egg and bread crumbs until the mixture just starts to hold together. Mix with your hands and then form into rounds the size of golf balls. 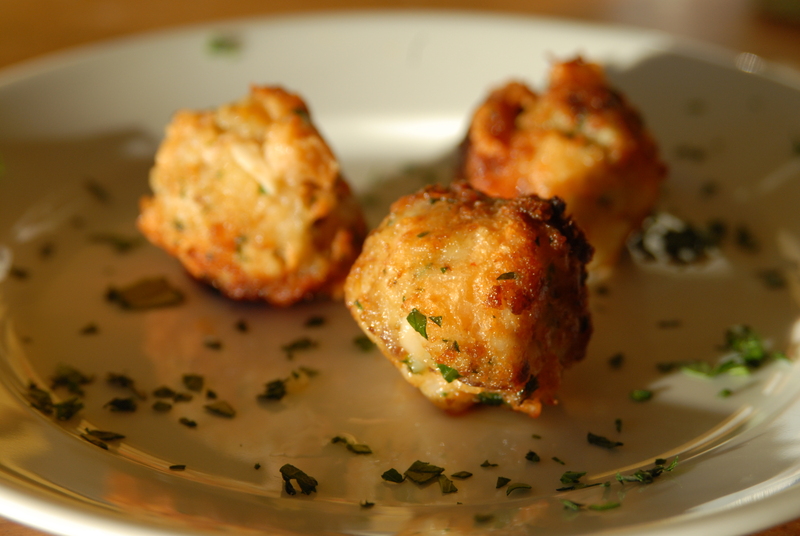 Fry the balls in oil and then add to a pot of marinara sauce. Cook for a few minutes. Serve as is or toss with spaghetti. 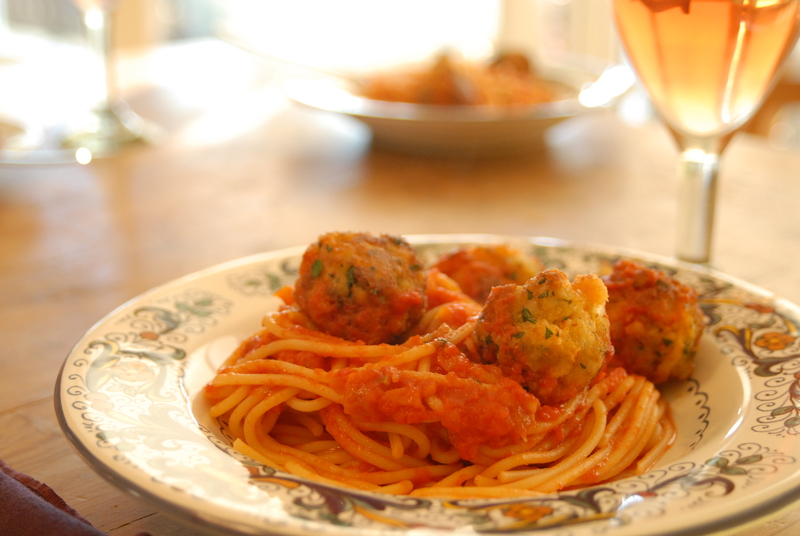 We try not to miss a single invitation to have dinner at an Italian’s home. Despite the effort it takes to eat an ungodly amount of food, in the end, it’s worth it. In the end, an invitation means we get to participate in one of Italy’s greatest rituals: surrounding a table with great people then completely covering it with platters of regional food cooked with family recipes. By now we’ve learned the etiquette: Ignore the hostess when she says “bring nothing” because “something” is expected whether it is a dessert, a bottle of wine, flowers (or all three.) We also know to expect a late night. Finally, there is no helping the hostess clean up. I’ve never seen an Italian guest even make an offer. And any attempt from us has been quickly refused. 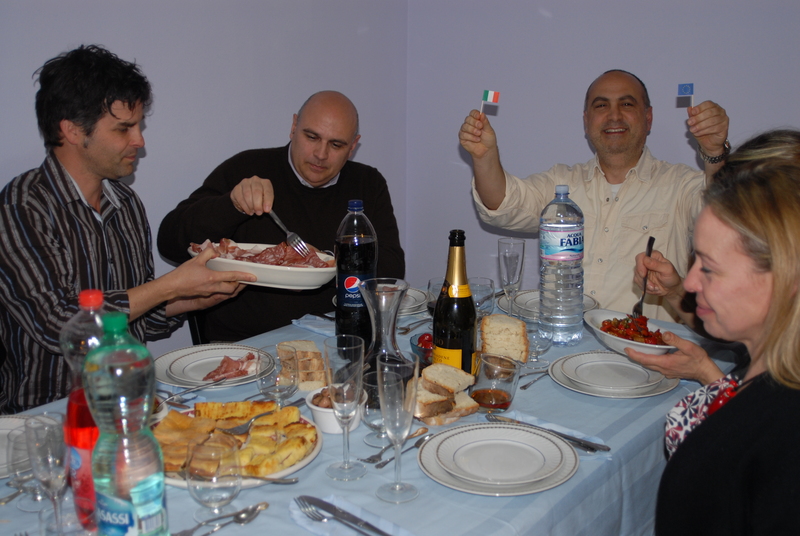 The rest goes without saying: eat a lot (always clean your plate) and accept seconds (say, “Bis, per favore!) if you want to compliment the cook. Dinner at Giovanni and Maria Pia’s. 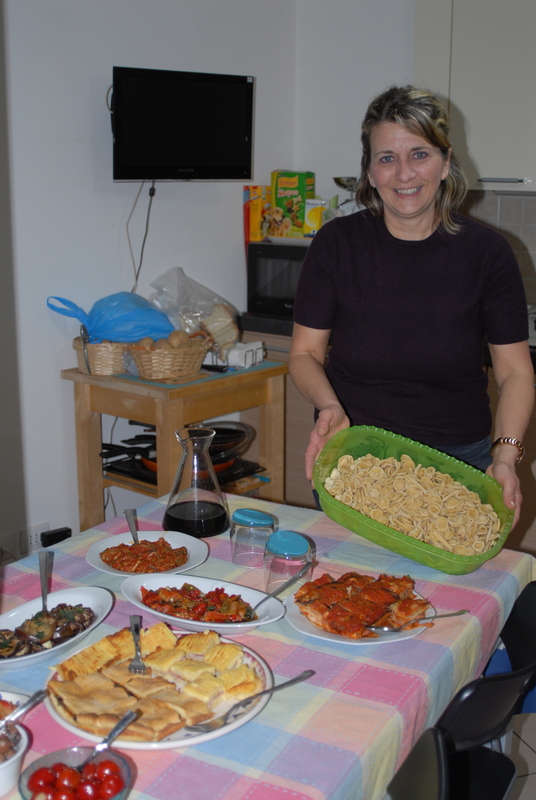 These are just the appetizers along with the uncooked pasta that Maria Pia made herself. 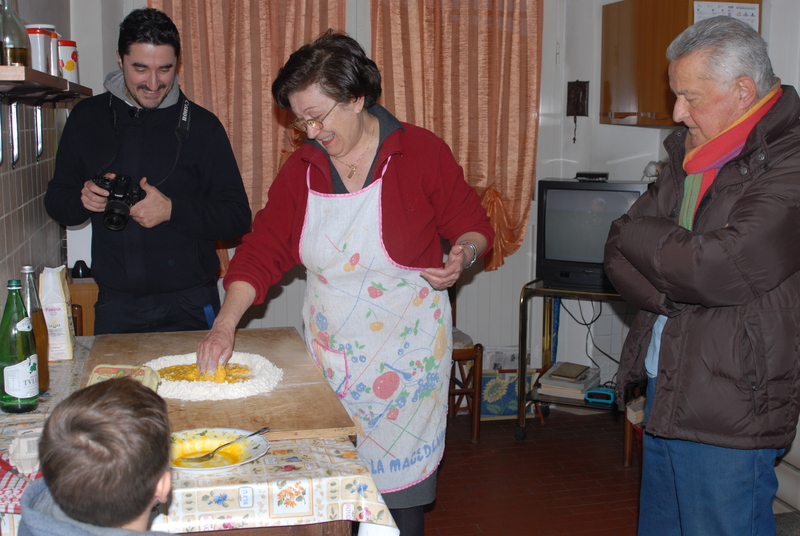 And all of the courses were typical Puglia dishes since Maria Pia grew up in southern Italy. Lunch in the countryside. 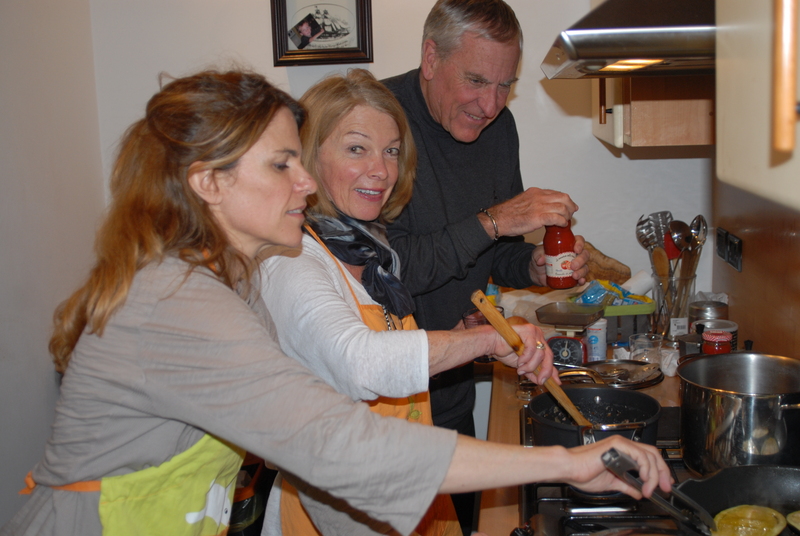 When we eat at Milena and Sergio P.’s, Milena’s parents do the cooking. This is her dad grilling three different types of meat. When we eat with Paola’s family, we are served traditional Umbrian specialties like pasta with wild boar and crostini with locally foraged mushrooms. In-between courses at Fabiola and Sergio D.’s: Fabiola cooked eggplant parmesan and pizza from her home town of Naples. 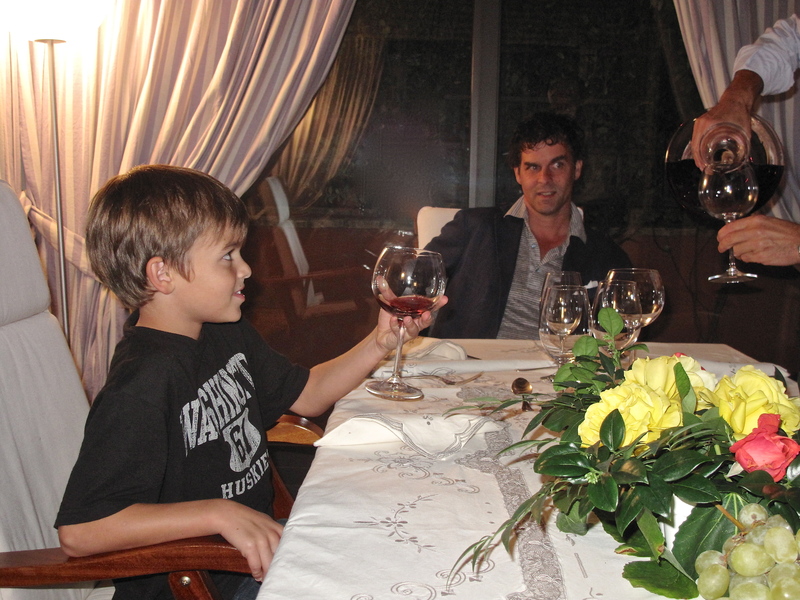 Sergio poured the kids a glass of wine. 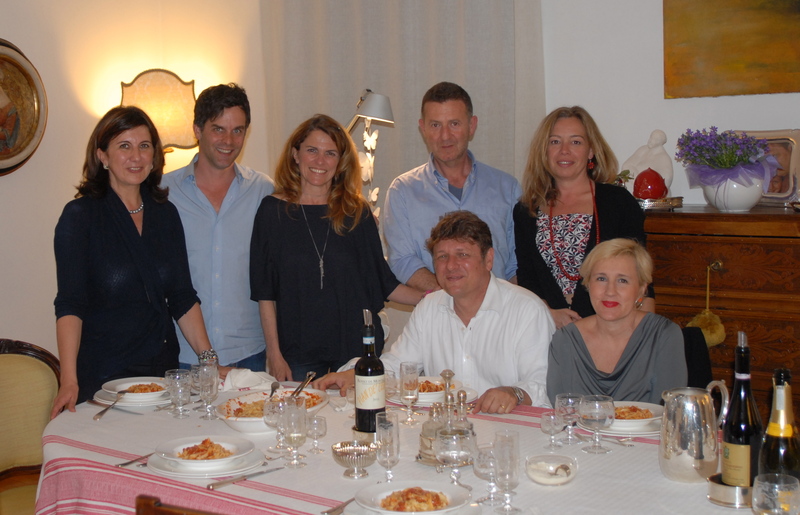 Last week we had dinner with several friends at Chiara and Emilio’s house. We could tell they had been cooking all day. 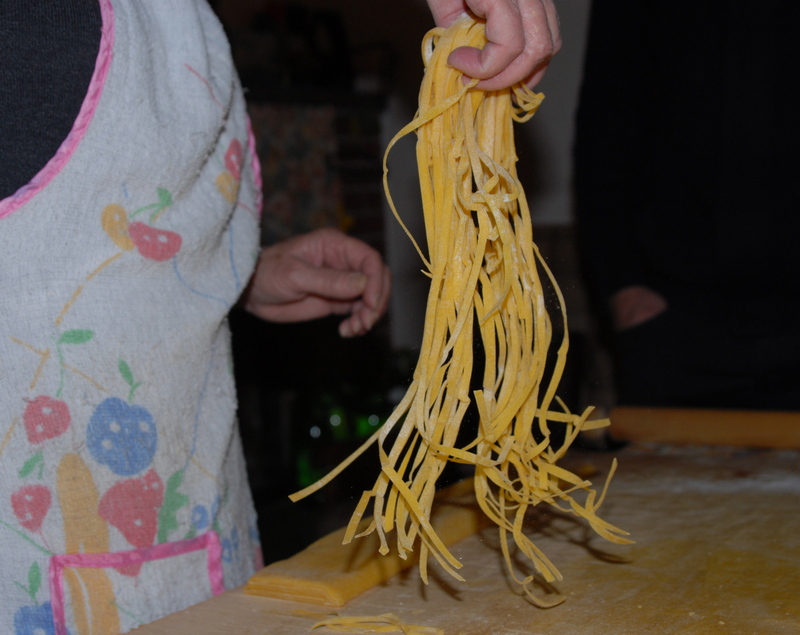 Here’s the homemade tagliatelle that Chiara rolled and cut that afternoon. The meat course was a roasted chicken that was out of this world. Chiara shared the recipe (see below). I also learned how to cut up the cooked chicken “Italian style”. Here is Emilio’s brother-in-law with the “chicken scissors”. Tonight we are having a guest for lunch. My friend Stacia is taking a little R&R from her sailing job in Sardinia. We want to show her some of the things we’ve learned to make. I will try to replicate Chiara’s chicken. She told me that the best way to add favor and keep the chicken moist is by making little incisions in the meet and stuffing it with lardo. By the way, lardo is not lard (but it’s close). It is not rendered or hydrogenated like the familiar lard from Grandma’s kitchen. There are two kinds found in Italy. 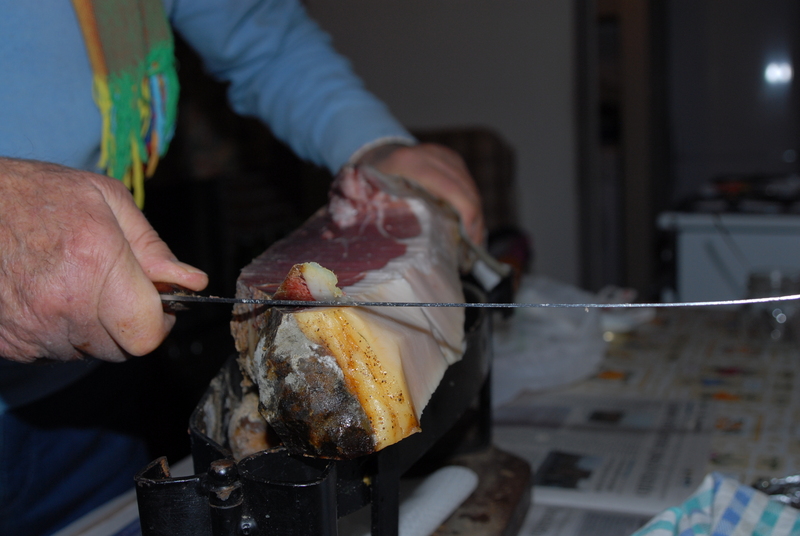 The first is a Tuscan specialty: cured and seasoned fat from the back of a pig. It’s common over here. In fact, we’ve ordered it in a restaurant where it comes in thin slivers on top of bruschetta. DE-licious. 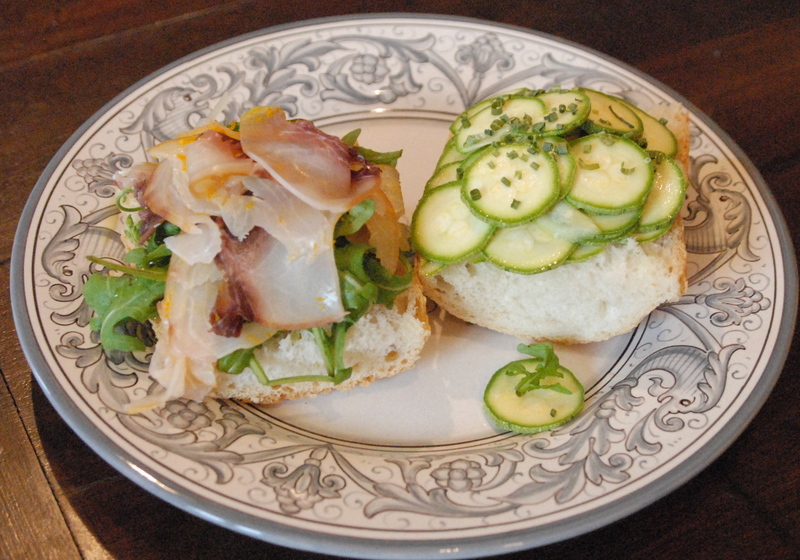 The second kind of lardo is what we use to stuff this chicken. It is ground and seasoned pork fat. It tastes like like the white part of bacon. In fact, that might make a good substitute if you can’t find it in an Italian specialty store. Generously sprinkle a chicken all over with a tablespoon of salt, a generous amount of pepper and two cloves of finely chopped garlic. Next, make six slits into the bird. Try to cut where the legs and wings join the body as well as into the breast (see below). Stuff the lardo mixture into the incisions. 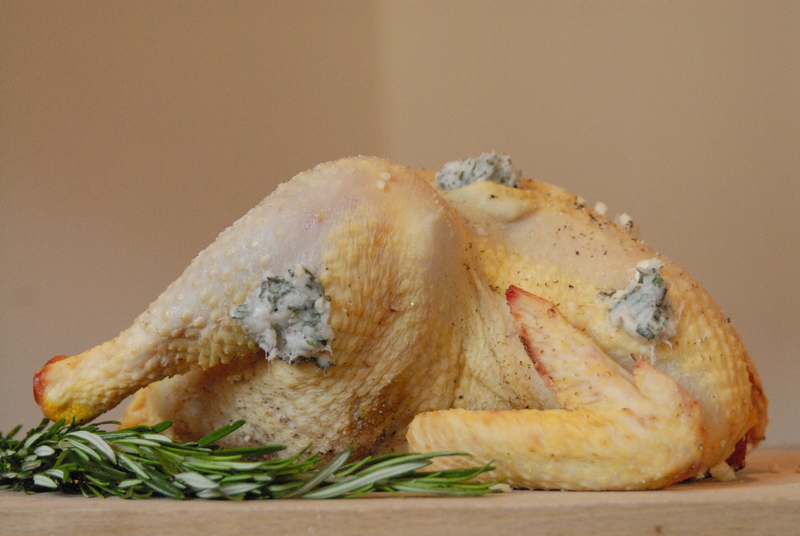 Lay several rosemary branches alongside the chicken and tie with string. 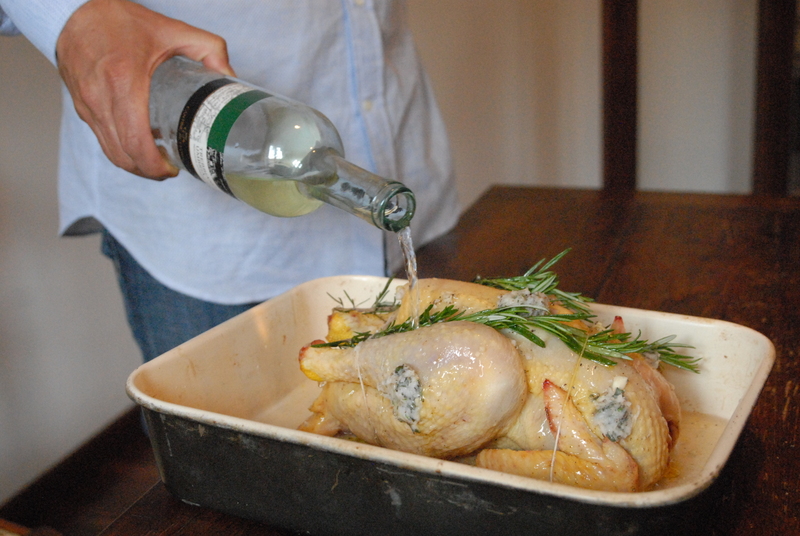 Set into a pan and drizzle with a little olive oil and then pour a half bottle of white wine over the chicken. Cook in a 425 degree oven (220 degree celsius) for two hours. Flip the chicken every 45 minutes then spoon the liquid from the pan on top. If you need more liquid, add more wine or water. When it’s done, cool for a while. Chiara cooked the chicken before we arrived and we ate it at room temperature. She showed me how to cut it up with a scissors which was so much easier than using a knife. To cut like Chiara, use a scissors strong enough to cut through bones. Her’s look like garden pruners. Begin by pulling the legs and wings away from the body and severing between the joints. Then, cut through the breast bone until the chicken is in two halves. From here, it’s very easy to cut away from the bone and serve it in pretty, small pieces. The holes are stuffed with lardo and the chicken is ready to cook. Four hours later . . . Our guest arrived. 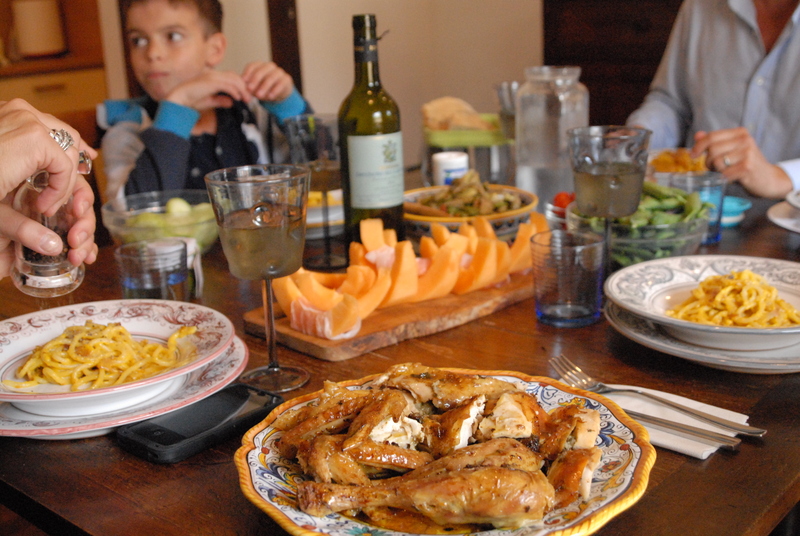 We served prosciutto and melon, pasta carbonara, fava beans with artichokes and a platter of chicken. Matt and Stacia are sipping limoncello as I write these final words. something more than a souvenir. The best vacations need to come home. 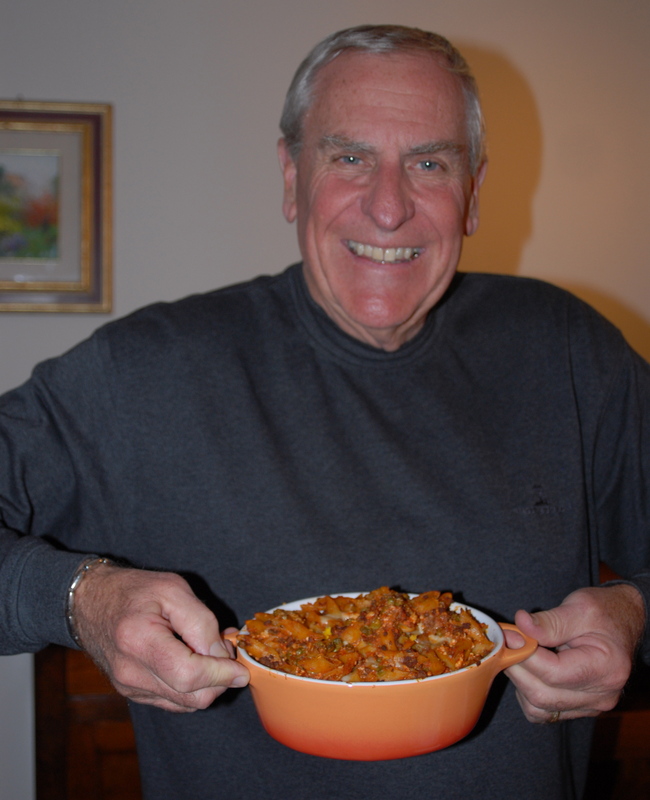 Pasta ‘ncasciata is a Sicilian specialty given to me by my friend Giulia. Her family is from the south where eggplants are reportedly the most delicious eggplants in the country. The name “’ncasciata” is a Sicilian word that may translate to either “cheese” or “pan.” (There is some disagreement among Sicilians.) Guilia says that both translations make sense since the pasta is cooked with cheese and baked in a pan. So on the evening of my parents’ last day, we shopped, chopped, fried, simmered and layered until we had made a beautiful pan of pasta. 2. Slice the eggplant lengthwise and sprinkle with salt. Then let it sit in a colander for 20 minutes so it can release its bitter juices. My dad cuts the eggplant into thin, even slices. 3. Sauté the garlic and onion in three tablespoons of olive oil until onions are translucent. 4. Add the sausage and ground veal and cook. Then add peas. Then wine. Cook until the wine reduces (about five minutes). Then add the tomato puree. Simmer slowly for 15-20 minutes. 5. In the meantime, rinse the slices of eggplant and pat dry with a paper towel. Then fry them in 2/3 cup of olive oil on medium high heat until golden brown. Set aside on a plate lined with paper towels. 6. Cook the pasta for half the time it calls for. (It will continue cooking later in the oven.) Drain the pasta. Add it to the tomato sauce. Add ricotta and mix well. Tear the basil into pieces and stir in. 7. Layer: Begin with a third of the pasta and tomato sauce. Cover with half the eggplants. Add half the provolone and one of the sliced hard-boiled eggs. Then add a layer of everything one more time saving a third layer of pasta for the top. Sprinkle with a tablespoon of Parmesan cheese. layering the pasta with all the ingredients. 8. Cook in a 350 degree oven for 1/2 hour or until hot, bubbly and slightly brown on top. Cool for 10 minutes before serving.
. . . I just got an email from my dad. The trip home was long. They are tired. The transition isn’t easy. However, the first dinner they made after unpacking their bags was pasta ‘ncasciata. In five days, my parents will be here. They are staying for three weeks in the apartment next door. For months I’ve been looking forward to their visit. 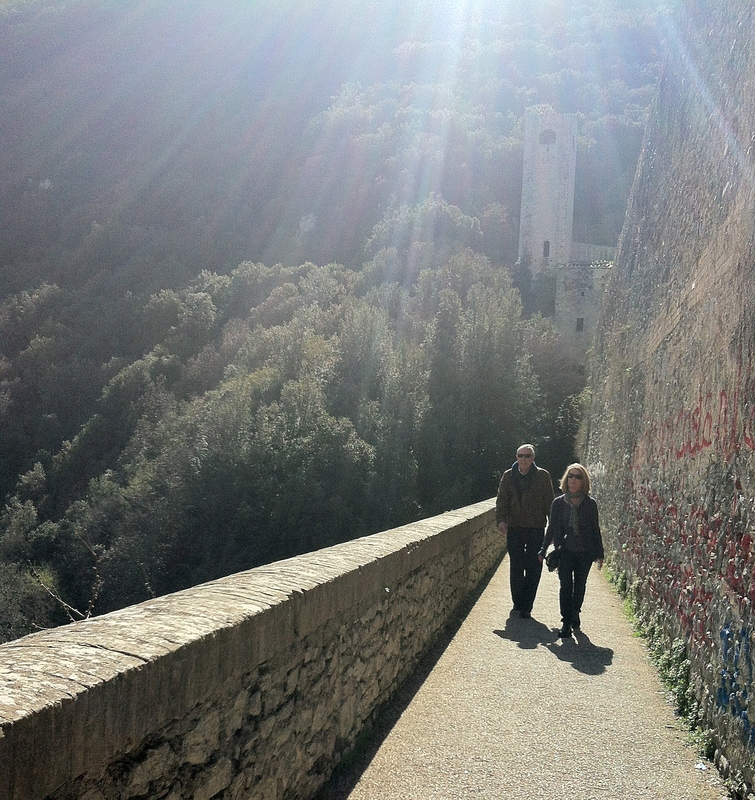 Like all our friends who have come to Perugia, they want to see more than the Etruscan Arch or San Lorenzo Cathedral. They want to see how local life is lived. They want to see where modern Perugians do their grocery shopping, take their evening walk and get a great espresso. So we’ll visit Cristiano’s pasta store, Rinaldo’s butcher shop and Marcello’s vegetable stand. We’ll walk down Corso Vannucci and Corso Cavour. And of course we’ll stop by Bar Alessi or Café Oscar along the way. But there’s another place I can’t wait for them to see. It’s Bavicchi, the spice/bean/chocolate/and so much more store. 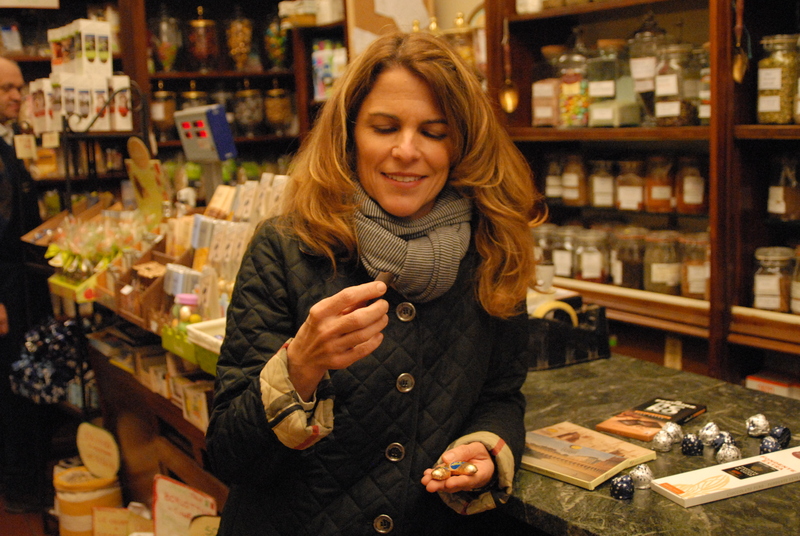 It started over a hundred years ago as a shop selling cleaning supplies and dried legumes. 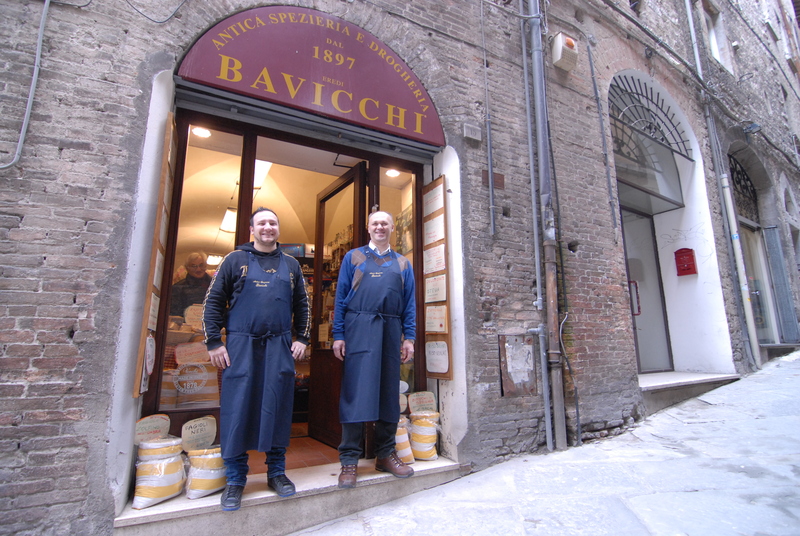 Bavicchi has maintained its roots while offering some of the most delicious standard and specialty ingredients in the historic center of Perugia. 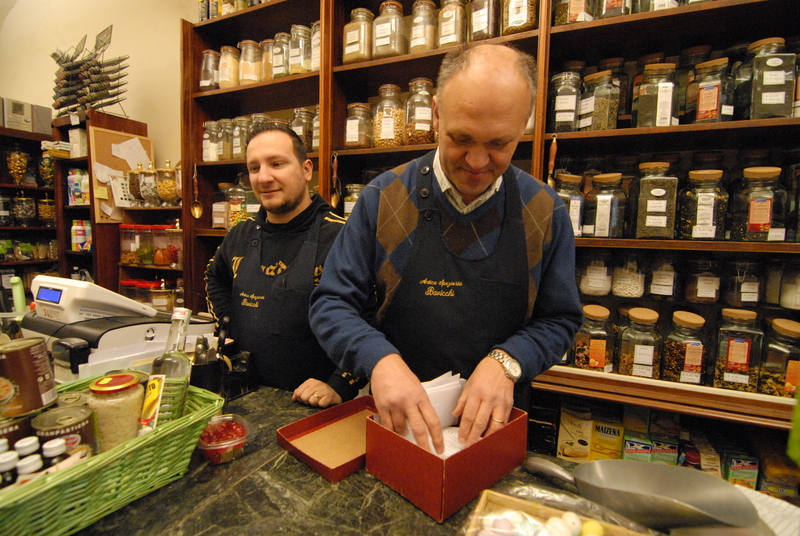 Owner Antonio Galli runs the small shop with his employee Federico Roselli. The space is a mere 320 square feet, but it’s bursting with variety. The walls are covered floor to ceiling in exquisite, colorful, aromatic, and even exotic goods. 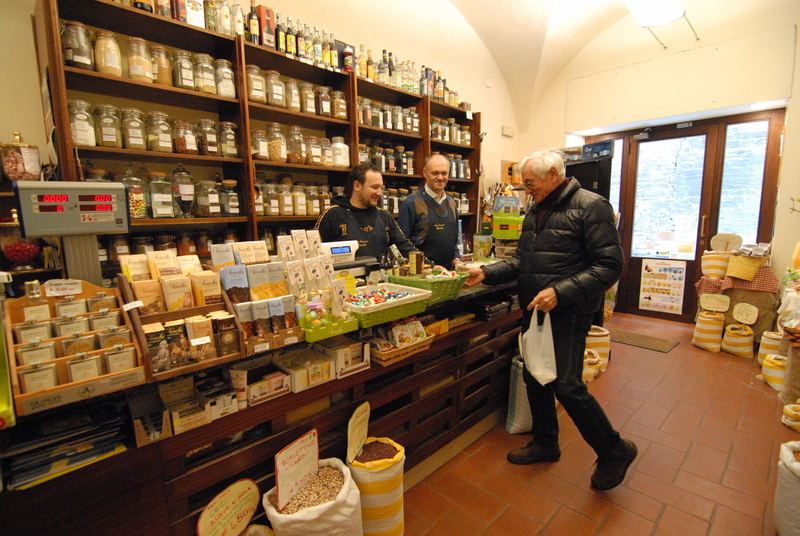 Besides beans (over 80 kinds) and spices (nearly 100), Antonio notes that many of his customers come in looking for nuts, dried fruit, and other ingredients for Italian desserts. Wines, honey, and chocolate are some of the other big sellers. Antonio also pointed out some of his more unusual offerings including maple syrup, tahini, powdered mustard, soy sauce, curry, and one jar of cranberry sauce (for the occasional American . . . in November). 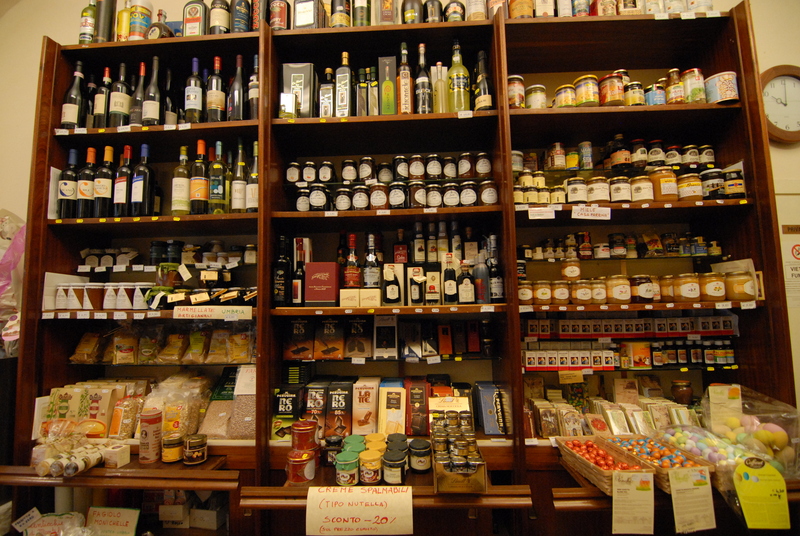 vinegars, wines, honeys and preserves. This is the house brand bitter. 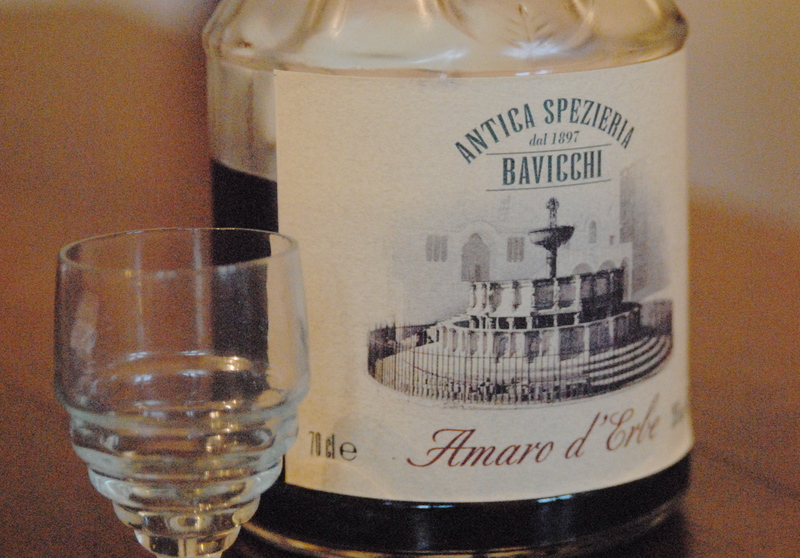 Like other amaros in Italy, this drink is served chilled and sipped after dinner. It’s dark, strong and herby; and the ingredients are top secret. Bavicchi is the only one who sells it. Bavicchi also has chocolates. 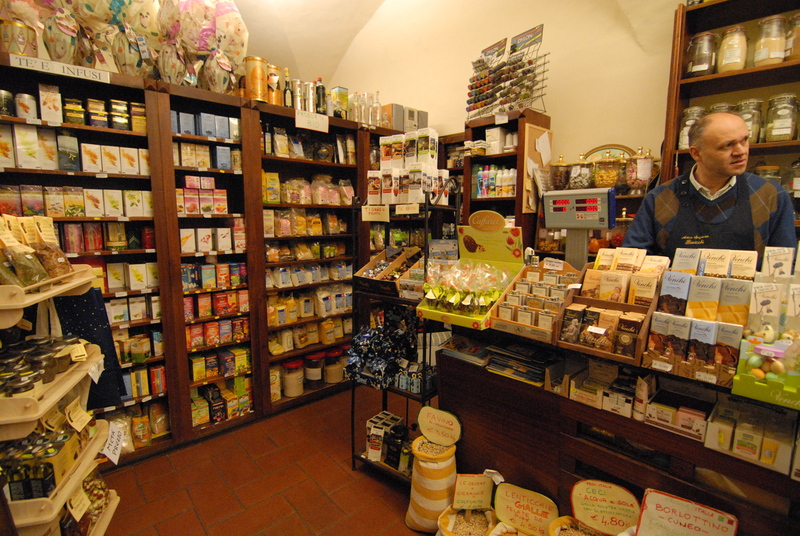 The most popular brand is Perugina chocolates which are made in Perugia’s oldest chocolate factory. Perugina began production 90 years ago and established the city as Italy’s chocolate capital. Since then, the company has been bought by Nestle. Vanucci is another brand on Bavicchi’s shelves. This is a high quality artisan chocolatier that tries to create what Perugina once made. They even have their own version of the famous Perugina Baci, only better. Then there is Augusta Perusia Chocolate. This is the smallest of the local companies. Beyond these three, Bavicchi sells lots of other Italian and European brands. With Easter just around the corner, a lot of the space in the store is used to display chocolate eggs. Federico offered me a banana chocolate that turned out to be surprisingly good. While hazelnut chocolate is everyone’s favorite in Perugia, banana chocolate is popular too. Sometimes I come in not knowing what to buy and needing a suggestion. When that happens, Antonio gets his red box of recipes off the shelf and hands me an idea. Today he gave me a copy of crostini con fagiolina del Trasimeno, an appetizer of toasted bread topped with beans grown near Lake Trasimeno, just 20 minutes away. We made it for lunch today and will make it again when my parents get here. While the beans are probably impossible to find back in America, one could make a similar spread with a creative substitute. 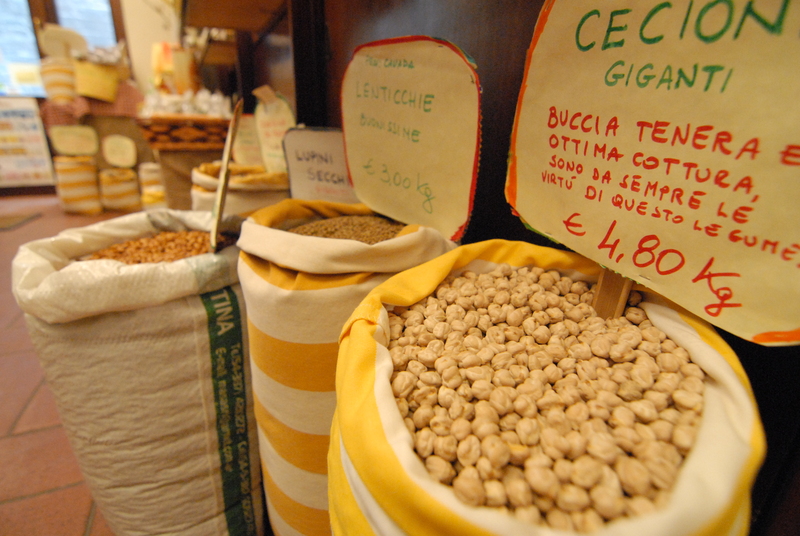 Note that these beans from Lake Trasimeno do not need to soak before cooking while many other beans do. Cook the dried beans in salted water with the carrot, celery and half the onion for 40 minutes. While they cook, sauté the other half of the onion in the olive oil until it is soft and translucent. Add the tomato puree, salt, pepper flakes and pepper to taste and continue cooking for 5 minutes. When the beans have cooked, add them to the onion/tomato sauce mixture. Add a cup of water and cook for another 20 minutes. 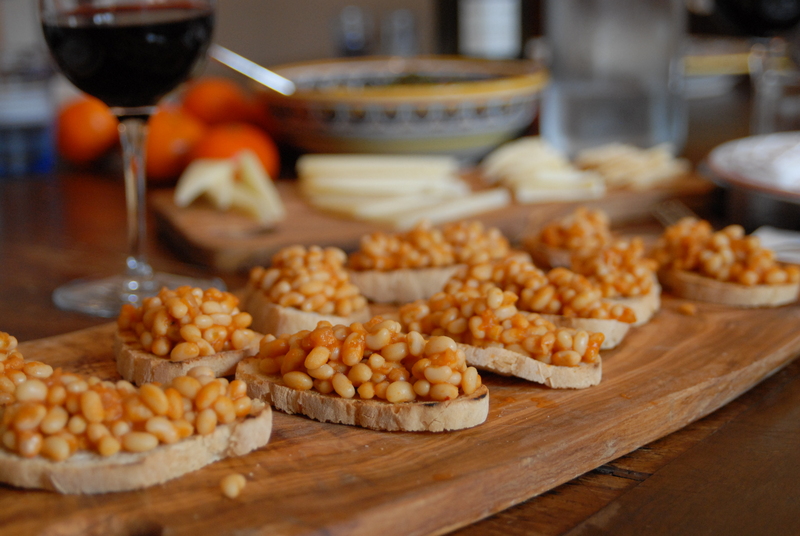 Spoon the beans on top of toasted bread and drizzle with olive oil and more salt. Serve as an appetizer. Or as we did, eat it as the main course. I haven’t taken an Italian class in over a month, but my teacher Luca and I still occasionally get together. It’s usually centered around food, culture or history, but mostly food. Recently, Matt and I met him for dinner at Ristorante Nana. This wasn’t your typical rustic Umbrian trattoria. This was fancy-pants Italian: raw fish layered and stacked with colorful, curly, green garnishes, black squid-ink pasta, vegetable foam, and a whole page devoted to creative dishes. For dessert we ordered “coffee and a cigarette” which was coffee gelato and tobacco-infused creme brûlée. 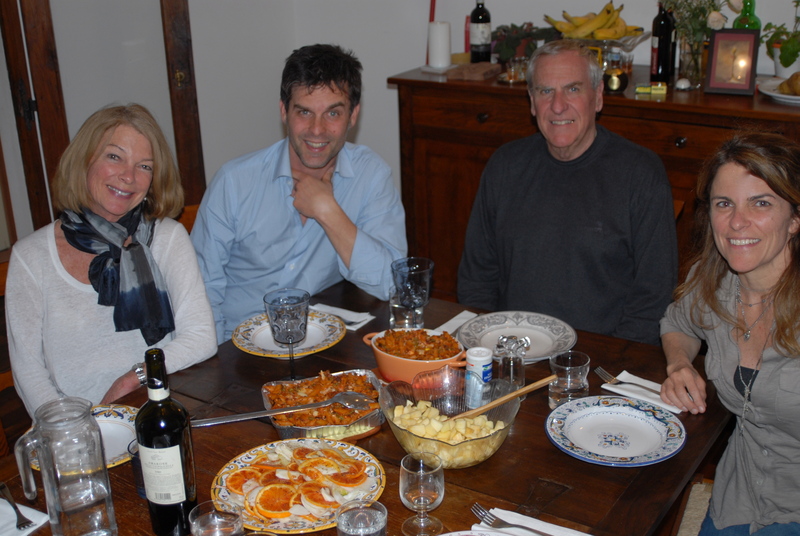 Several days later, Luca invited us to his parents’ home for dinner. He picked us up early so we could see how his mom makes fresh pasta. 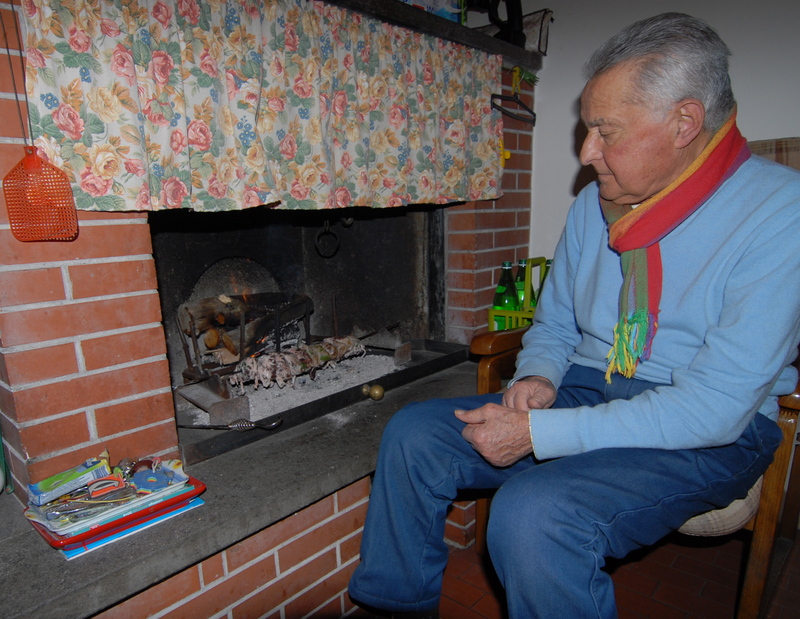 His family lives outside Perugia in a charming, old farm house. We entered through the kitchen which occupies the space where the previous owners (many years ago) housed livestock. Now there is a fireplace on one wall, a wood-fired stove and oven against the other, a television in the corner, and most importantly, a work table used for rolling and cutting fresh pasta dough. 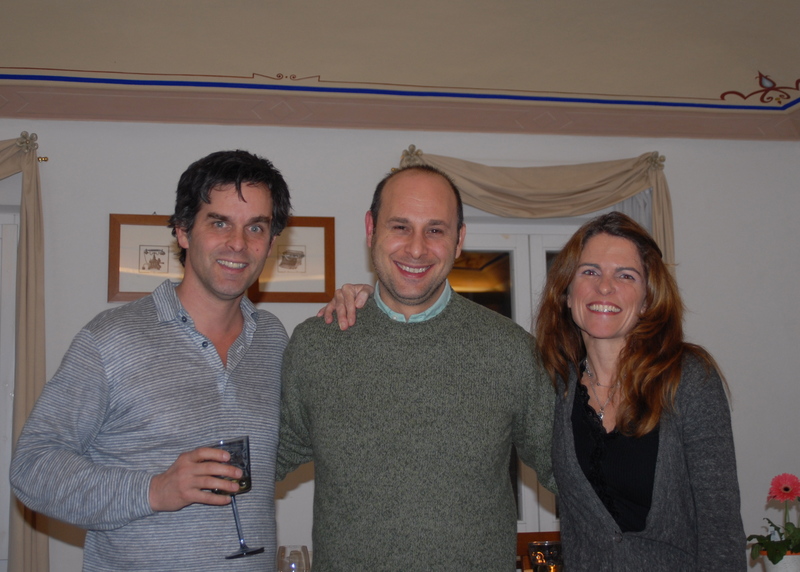 We met Luca’s parents, Mirella and Giulio, who gave us Italian kisses on the cheeks and then offered the boys chocolates. It was all so warm and cozy, and I happily spent the next four hours dressed in an apron “helping” Mamma Mirella make dinner. We started with tagliatelle. 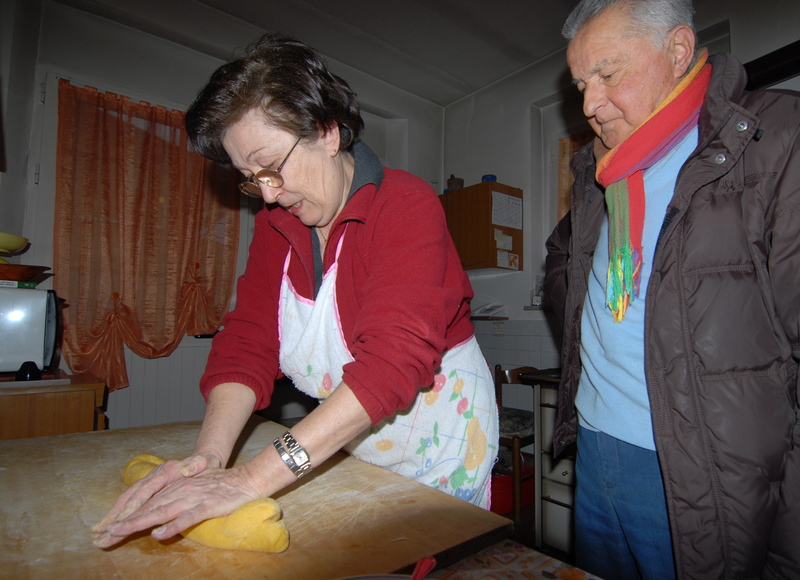 This is a type of pasta that Mirella has been making by hand since she got married. There are only two ingredients, eggs and flour. We began by measuring. For each egg, she uses 100 grams of flour. She piled the flour on the table and made a well in the center. Then she cracked open the orangest eggs I’ve ever seen. “How in the world? !” I asked. She said that the chickens eat really well over here. Next, she beat them in a bowl then poured them into the flour. Slowly with her fingers, she gently mixed it all together. Luca, Guilio and Ray watch the demonstration. 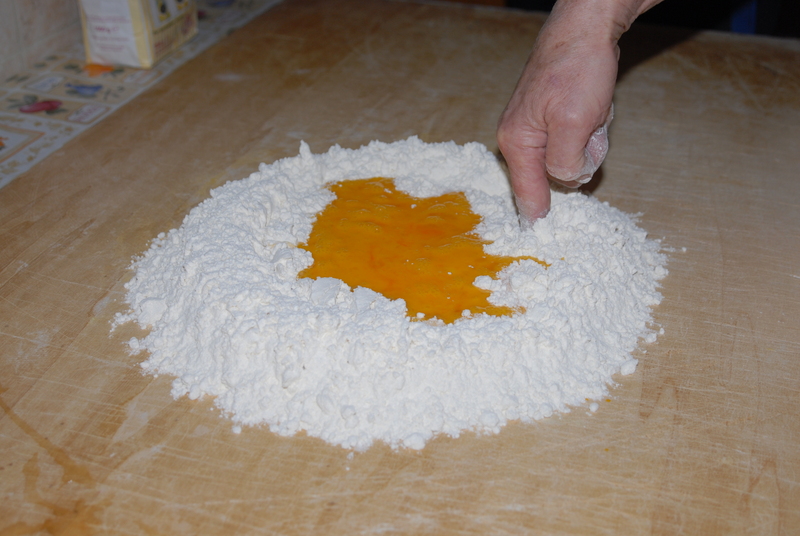 Once the flour and eggs were combined, the kneading began. With the palms of her hands pushing the dough into itself over and over, the mixture became perfectly smooth and evenly yellow. Once in a while, Mirella would add just a tiny bit of water if it felt dry. 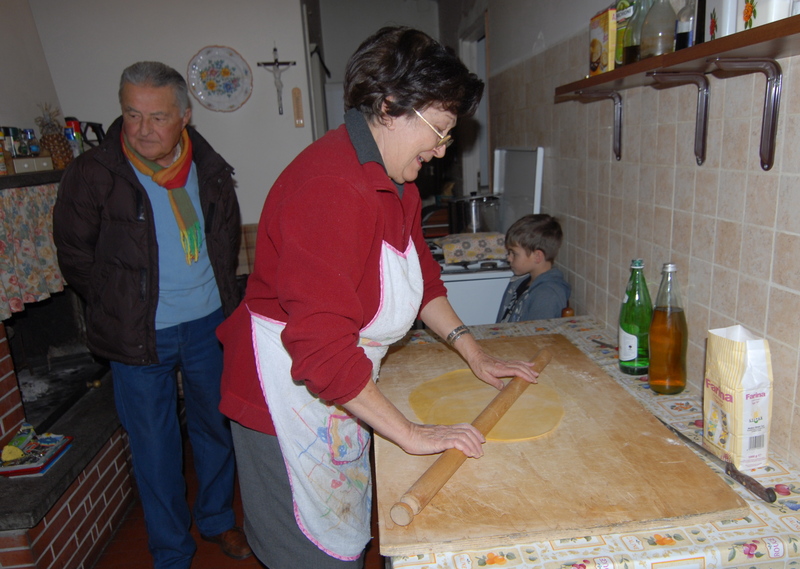 Mirella kneaded the pasta for at least 15 minutes. The next step was to roll the dough into a thin sheet. Again, this took some patience. With a long rolling pin, we eventually succeeded in spreading it all the way to the corners of the cutting block. When our arms were exhausted, and the pasta was stretched so thin that it draped over the table, Mirella let it sit and dry out a little. In half an hour it was ready to cut. The sheet of pasta was folded over and over until it was about 3 inches wide. Each layer had a little flour sprinkled on top so it wouldn’t stick. Then she sliced it all into thin strips less than a centimeter wide. 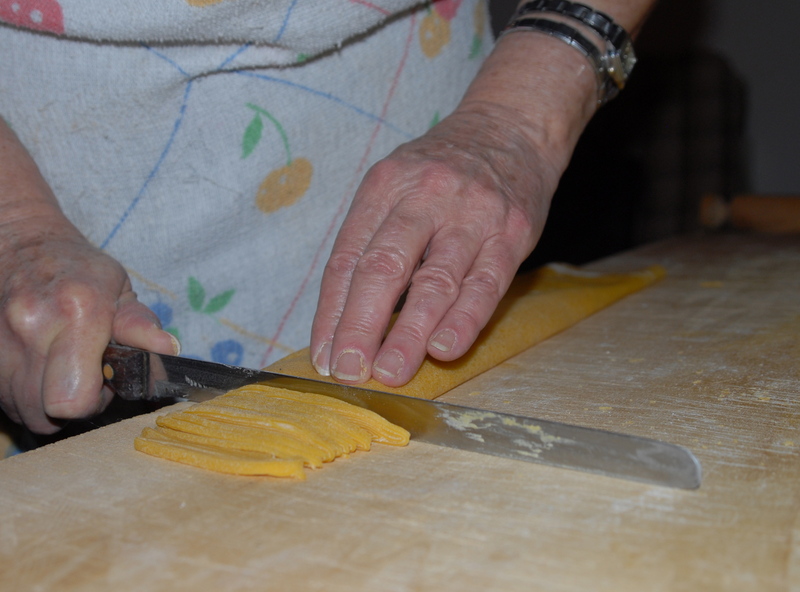 After all the tagliatelle was cut, Mirella shook the long strands out to separate them from each other. Then she set the pasta aside until it was time to add it to the boiling water. Next we walked outside to the cantina where Luca’s parents store their canned foods and home-cured meats. Giulio brought a prosciutto inside the house so he could prepare a platter of charcuterie for an appetizer. 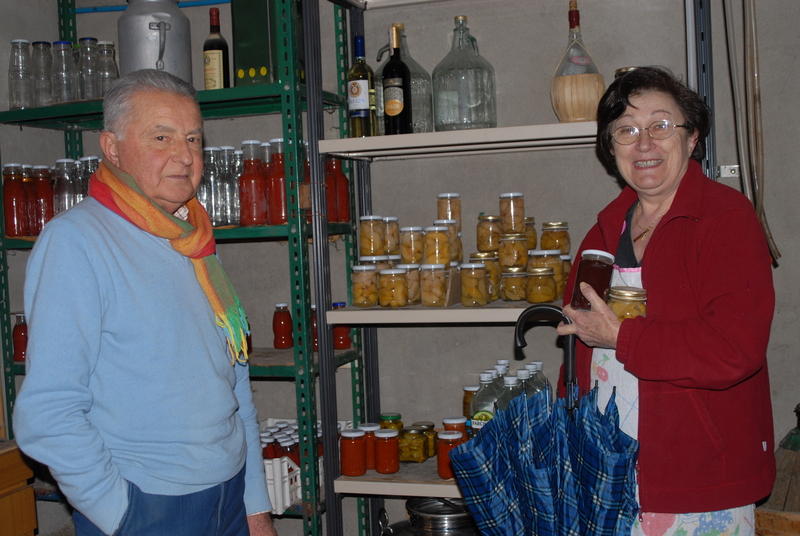 Out in the cantina, Mirella filled a bag for me to take home with peaches, jam, hot peppers and pasta sauces. To my surprise, she also gave me two pounds of tagliatelle that she had made the day before! Giulio offered us slivers of proscuitto while he worked. 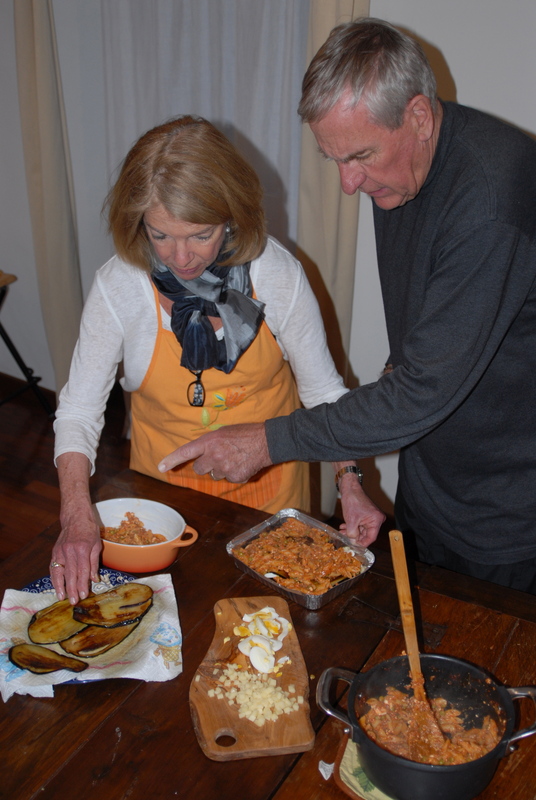 Several other guests arrived as Mirella and Giulio finished making dinner. Earlier they had prepared a mixed grill including sausages, marinated pork ribs and pork livers wrapped in stomach lining. 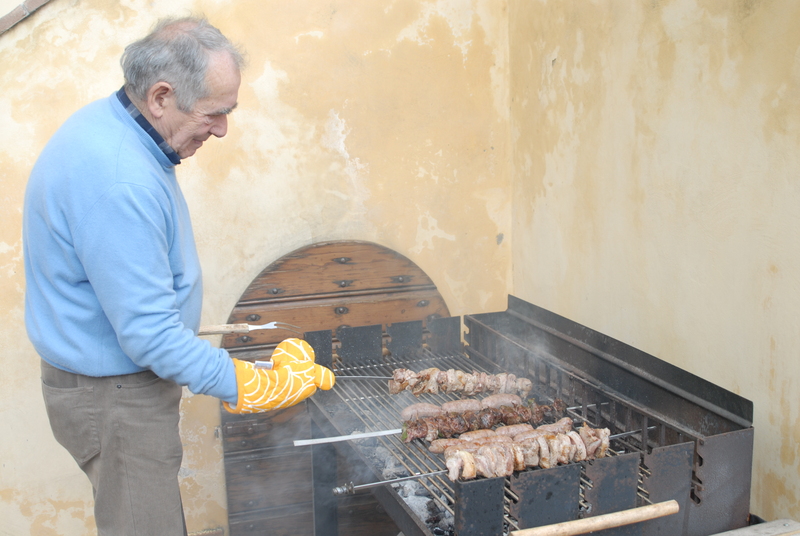 We skewered them on iron stakes and set them in the fireplace where Giulio kept an eye on them while they cooked. 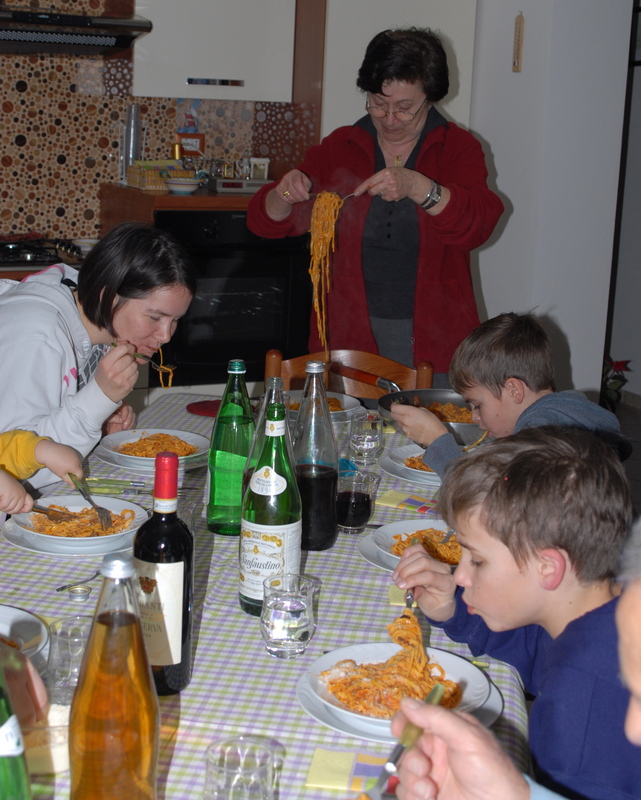 Finally, after Mirella boiled the pasta and tossed it with a tomato meat sauce, we sat down at the table for a feast. The meats cook near the fire over hot coals. 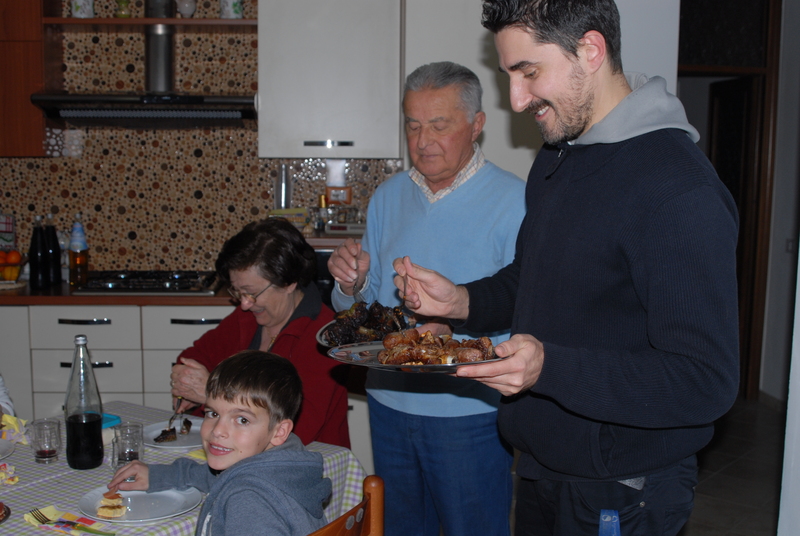 Luca and Giulio serve the meat. Ray politely declined the barbecued liver. We sat around the table until after 10 pm eating plates of food and drinking wine from the neighbor’s grapes. It was unreal. The whole day was an Italian fantasy. 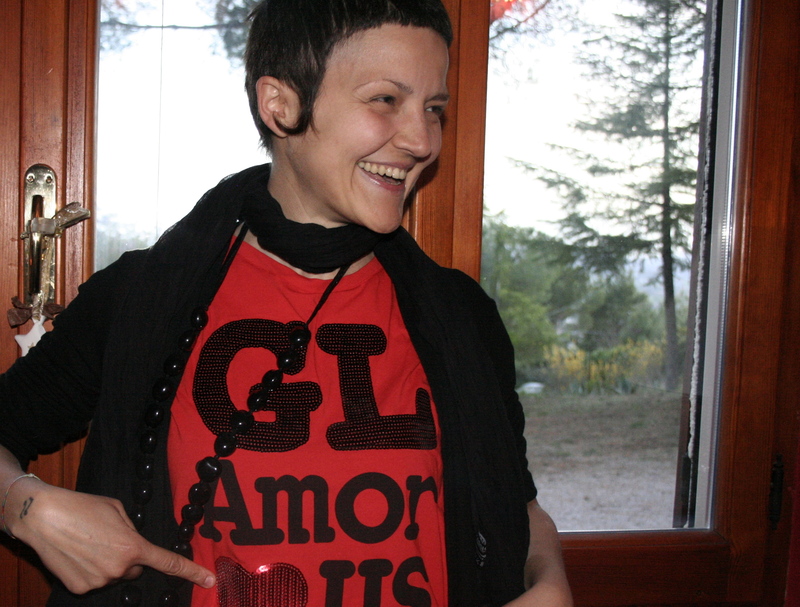 I was so happy to wake up the next morning with a bag full of provisions from Mirella and Giulio sitting on my kitchen table. We already used one jar of sauce and a pound of tagliatelle. I’ll save the second batch for a special dinner since I don’t know if I will be making pasta by myself away from the magic of Mirella’s kitchen. If I were home, I would not write a post on what I ate for dinner. But somehow here, it seems interesting. There’s subtle magic in our Italian kitchen. Cooking isn’t a chore. It doesn’t tire me out. The ingredients are more compelling and everything tastes better. I know it’s not me. I’m not a chef or even close to one. I’m not especially intuitive in the kitchen. I don’t even know why certain ingredients go together. However, we eat really well here. I think one explanation for the elevated quality is due to the contagious passion of the Italians. They believe in their food. They talk about it like a sports fan talks about the playoffs. This week I listened to a grocer describe the nuances of a tiny green legume that grows 15 miles outside the city. He went on and on. By the end of his speech, I was heading home with several bags of beans and a single-minded enthusiasm to cook them all. I had never succeeded in properly cooking a dried bean at home. Never. (The long soaking, the slow simmering and the seasoning were too tricky.) Yet here, beans come out just right. The beans feel good. I’d like to have a little legume sandbox when we get home. Later, we tried it in soup. It gave us the confidence needed to make it for company, and that’s saying a lot, because it is so intimidating to cook for Italians. They each have conflicting opinions about what ingredients should go in what dish. They fiercely believe in their own family recipes. And culturally, the whole set-up is different. 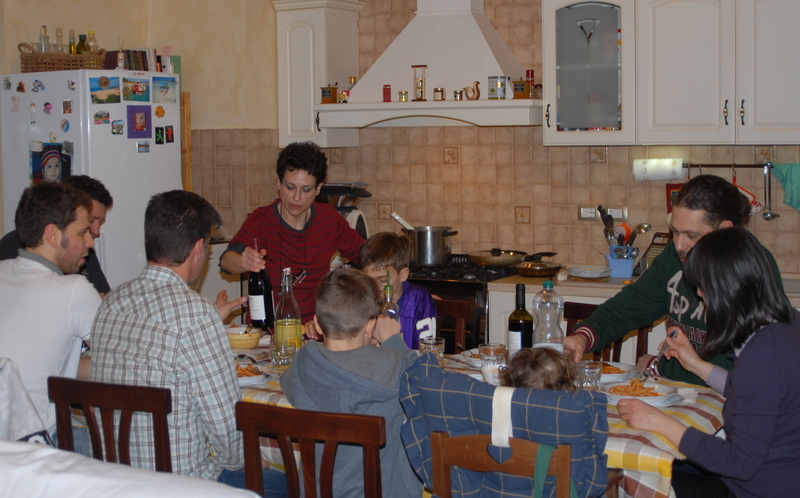 To begin with, guests arrive no earlier than 8:00 at which point the host has finished preparing the meal. Appetizers are served while seated at the dinner table. Wine is drunk during dinner, but the drinking isn’t as heavy. The speed at which one eats is greater. The servings are bigger. But the biggest difference is the quantity of courses. I tried to follow these guidelines when Cristiano, the Pasta Man, came to our house last night. He arrived at 8:00. Of course, the bean soup wasn’t the only thing we served. 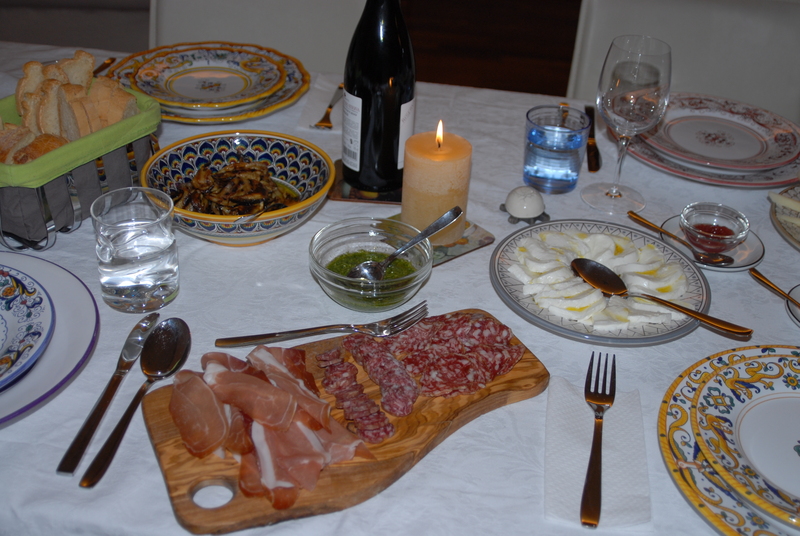 It was one of 10 plates of food we ate throughout the night including Umbrian cheeses, Umbrian meats, grilled eggplant, pasta and bean soup, a lemon caper chicken, three sides of vegetables and a tray of oranges with olive oil. 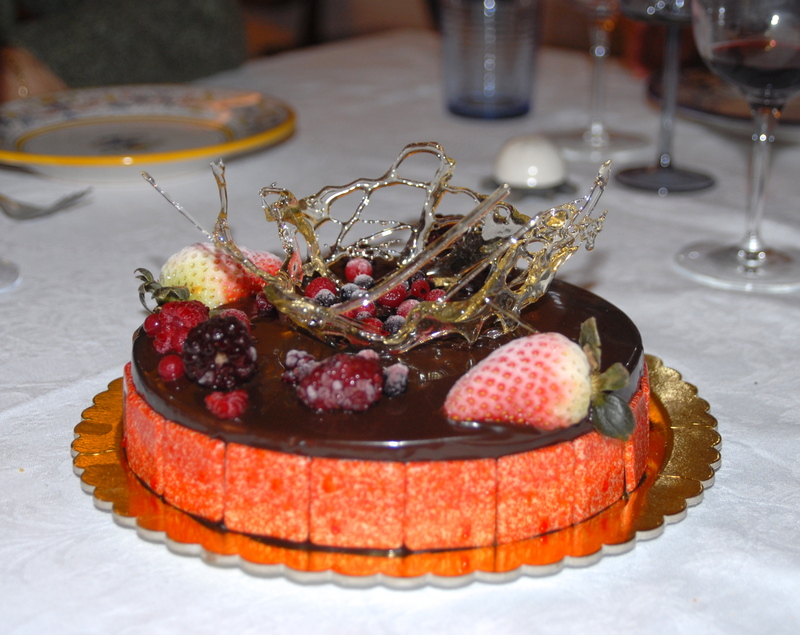 The prettiest course was the cake we bought from across the street for dessert. The inside was chocolate. The berries were covered in a sugar glaze. Eating only took a couple hours. Then we poured grappa, vin santo and herbal digestivi while sitting around talking. The Italian election is coming up; politics was one of the topics, as was Star Wars, Clint Eastwood, the new marajuana laws in Washington State and the Mafia in Perugia. By midnight Cristiano left and we started cleaning up. We had a huge mess. The leftovers barely fit in the fridge. We will be eating soup for a couple days, but that’s okay, because, like I said, I’m really into it right now. In case anyone wants to try it, I’ll leave the recipe below. God, I hope it turns out tasting good even outside of Italy. 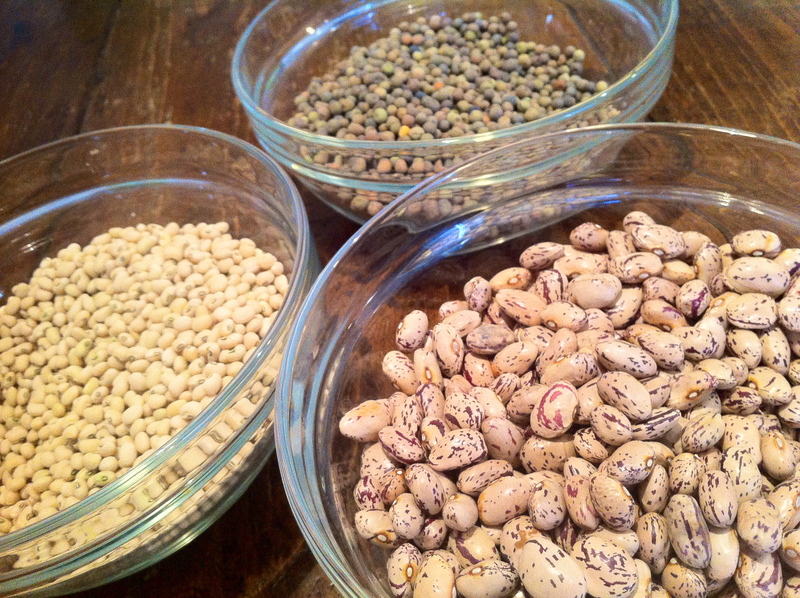 Begin the day before by covering the beans in water and soaking them for at least 24 hours. Two hours before you start the soup, begin simmering the beans in a pot of water. You can add a little flavor by adding half an onion or some garlic to the pot. Cook for a couple hours or until the beans taste done. 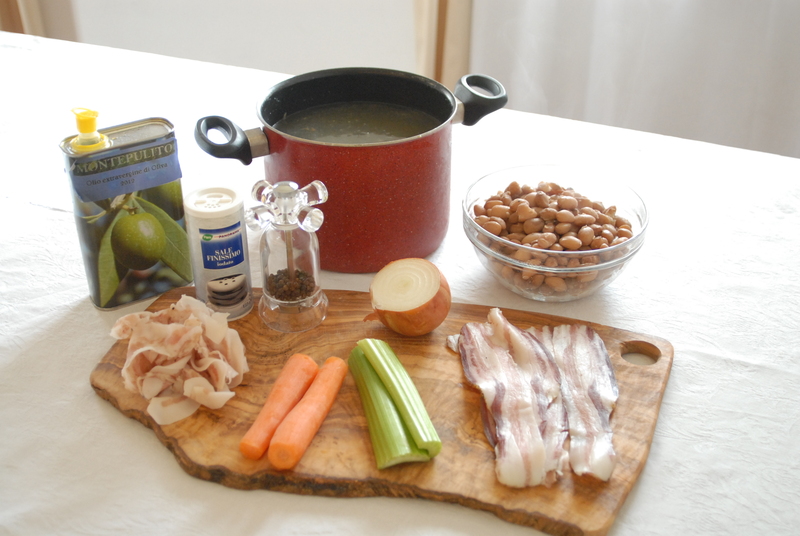 When you are ready to cook the soup, cut the guanciale into small pieces. 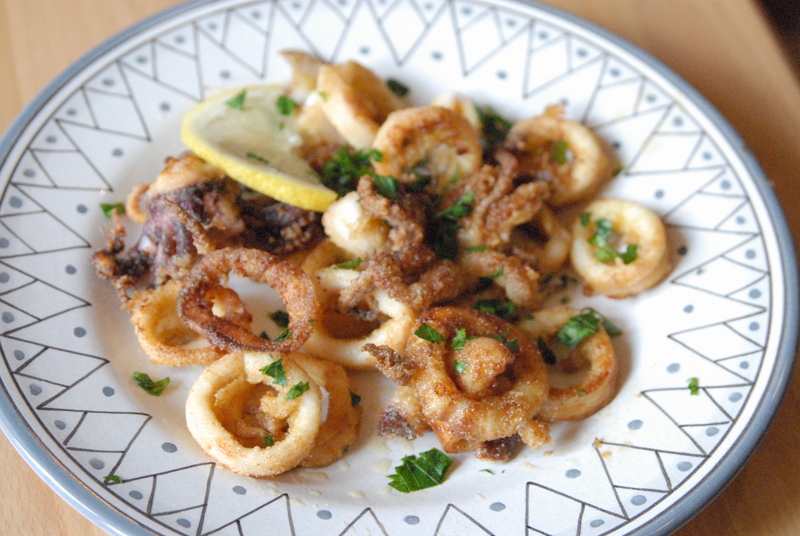 Fry it in a pan over low heat with a tablespoon of olive oil for 5-10 minutes. Before it browns, add the finally chopped onion, celery and carrots. Cook together until the vegetables are very soft. Then add a cup of broth and cook until the liquid has evaporated. Meanwhile, in a second pot over low heat, cook the pancetta in a tablespoon of olive oil. After about 10 minutes, but before the pancetta crisps, add the cooked, drained beans. Mix them together and then add the broth. Let the beans absorb the broth for a bit then add the guanciale/vegetable mixture and cook together for 5 minutes. In a separate pot of boiling salted water, cook the pasta for half the recommended time. Then drain and add the pasta to the beans and cook until the pasta is al dente. Add salt and pepper if you need. When we cook here, we just take one of these courses and turn it into our entire meal. Our favorite is il primo, and it’s always pasta. But after months of noodles, we’ve decided to branch out and try something else. During the past several weeks, we’ve learned a couple alternative primo courses. One features lentils, the other chickpeas. These are the easiest dinners to cook as well as some of the best. In order to make these, you need vegetable stock. I’ll start with that. Any variety of vegetables can be added, but we like using 2 potatoes, 2 zucchinis, 2 tomatoes, 2 carrots, 2 celery stalks, 2 onions, a small bunch of parsley and two teaspoons of course salt. Back home I just throw it all together in a pot of water, but Italians wouldn’t hear of it. They carefully wash and peal everything. Only then do they put it in a pot, cover it with water and set it on the stove to simmer. I forgot the celery in the last picture, but you can throw it in anytime. 1. Put the lentils in a small pot and cover with three cups of water. Bring to a boil and then simmer for ½ an hour. Add more broth if needed. 2. In a separate pan, sauté the onion until it is soft and translucent. Remove the sausages from their casing and crumble into the pan. Cook until done. 3. Add the lentils with their liquid to the onion and sausage. Add the tomato sauce. Continue cooking for at least another ½ hour, adding the remainder of the broth one cup at a time. Dinner is ready once the lentils are soft and cooked through. It is best served in bowls, as it resembles a thick soup. Add Parmesan cheese if you’d like. Everything is on the stove: sausages in the pan, lentils in the pot and broth simmering in the back. 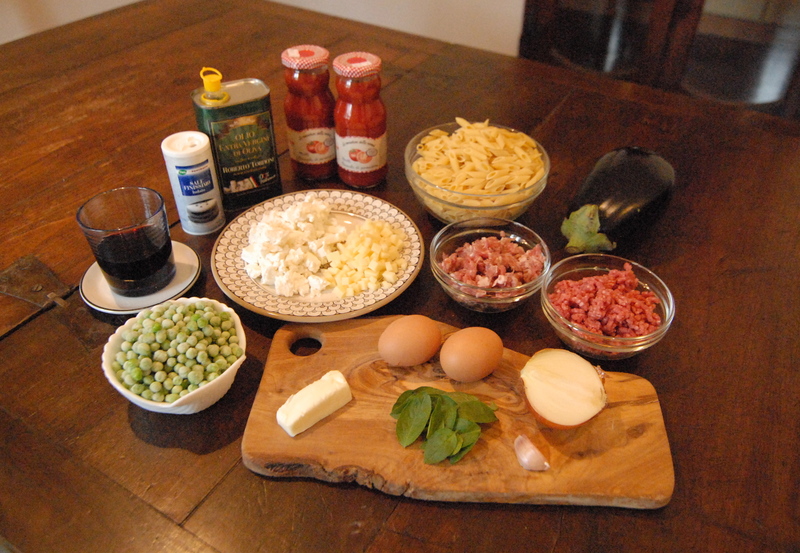 Monia from Il Parma told us about this recipe. We’ve made it at least five times, and we’re having it again tonight. You can use dried chickpeas if you want, but I’m just terrible at cooking dried beans, so I resort to a can or a jar, which is what Monia uses anyway. 1. Sauté the chopped garlic and the rosemary in the olive oil over medium heat for about a minute. 2. Puree one jar of drained chick peas with a little broth. Add it to the garlic and rosemary. Add the other drained jar of whole chickpeas. Add the vegetable broth and and cook for half an hour. You can remove the rosemary after 10 minutes so it doesn’t fall apart. 3. Add more broth if needed then add the pasta squares and cook until they’re done. 4. Add salt if needed and serve. Olive oil is nice to add on top. Monia with a jar of chickpeas. She gives us recipes as she bags our groceries. Next week, we might ask her to teach us about polenta and risotto.